Constructed with heavy duty 16-gauge steel reinforced by expert craftsman hand TIG welded seams; Commercial Pro HD boxes keep equipment safe and dry. The reinforced and insulated high dome lid featuring an ultra-tight weather proof bulb seal and adjustable J-bolt striker mount is bolted to the box body with a heavy duty aluminum piano-style hinge for unequaled strength and durability - even in the coldest weather. Single-handed operation is a breeze with commercial grade self-rising gas shocks and weather -proof quick release, locking push-button latching system. The heavy duty body includes a large 4 section, lockable steel sliding tool tray, and two rugged Steel D-ring Tie downs to secure bed cargo. Easy no drill J hook mounting hardware and rubber mat are included. 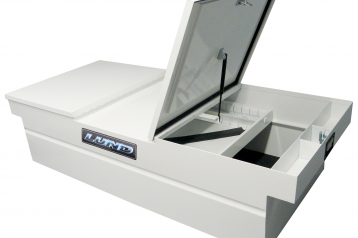 LUND Pro boxes are 100% Assembled in the USA and carry a Limited Lifetime Warranty.